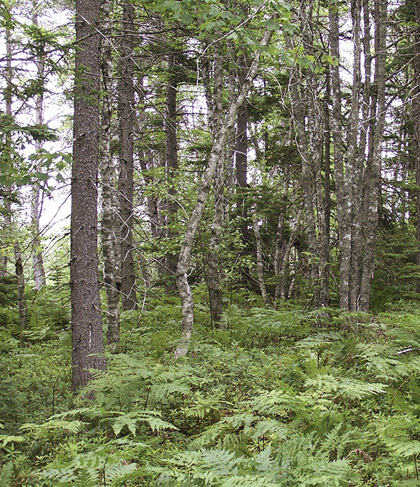 Concept:This early to mid-successional Vegetation Type (VT) supports a mixedwood canopy and a relatively broad suite of herbaceous plants compared to other black spruce dominated VTs. Black spruce – Red maple / Bracken – Sarsaparilla usually follows stand-replacing disturbance events such as fire, windthrow or harvesting. Vegetation: Black spruce is the dominant overstory tree, but red maple (with its greater potential for crown expansion) also occupies a large proportion of the canopy. White birch, balsam fir, hybrid (red/black) spruce, trembling aspen and white pine can also be found in this VT. Regenerating black spruce and balsam fir dominate the shrub layer along with wild raisin, lambkill, velvet-leaf blueberry and false holly. Bracken and bunchberry are the main species in the herb layer, but a variety of other plants can also be found including sarsaparilla, teaberry and starflower. Bryophyte coverage is generally low with leaf litter dominating the forest floor. Environmental Setting: SP6 is associated with fresh to moist, nutrient poor soils. 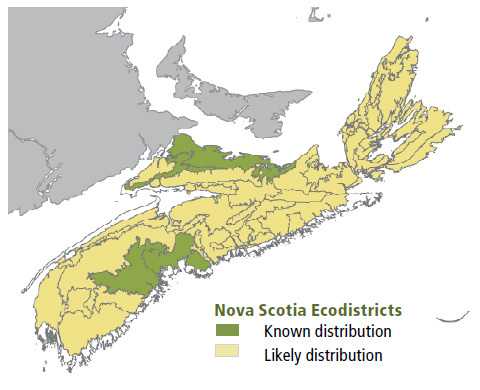 This VT can be found throughout Nova Scotia on a variety of soils with low nutrient status. This VT is widespread and common across the Maritime provinces. Successional Dynamics: Nutrient poor soils and stand-replacing disturbances strongly shape both VT canopy structure and successional patterns. This generally even-aged VT usually follows stand-replacing disturbances, with harvesting the most common cause. In the absence of similar disturbance events, SP6 may succeed to a more softwood dominant stand with SP4a (White pine / Blueberry / Bracken variant Black spruce) and SP5 (Black spruce / Lambkill / Bracken) possible outcomes. SP5 is the edaphic climax for this successional pathway. and other species, and for winter food by deer foraging on fallen trees. 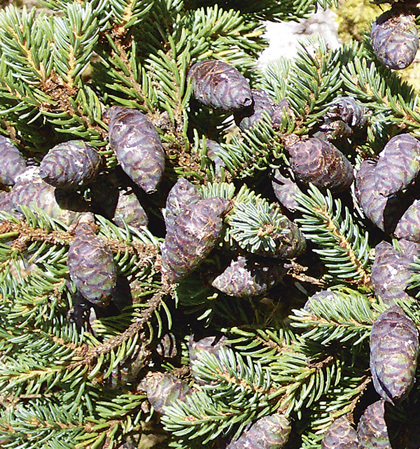 Distinguishing Features: This softwood forest of black spruce occurs on imperfectly drained soils. Species indicative of moist soils should be present, especially sphagnum in the depressions, cinnamon fern and/or creeping snowberry. False holly and sedges are common.